Promoting your product, a campaign or an event? Stand out in the crowd! We've got you covered from national campaigns to your day to day promotional graphics. A national campaign (much to the Brewmaster's horror! ), included poster, sell sheet, website graphics, social graphics, coaster design and tent card design. Marketing copy and graphics were needed for this project, to promote HBC beers on premise and online. An epic event, that needed epic promotion, included posters, tickets, website graphics, social graphics, table talkers and bill fold flyers. A fun infographic to show outcomes and statistics from the Hottest 100 Australian Craft beers of 2017 in an interesting way. Used nationwide, this infographic was done for the Crafty Pint. Empowering women in the beer industry is pretty important! These T-Shirts were designed to promote and raise funds for the society during Good Beer Week in Melbourne. Everyone loves a summer parking lot party! The brief was to make it Tiki themed, and make it look like it was hot! A combination of digital illustration and design led us to this result. 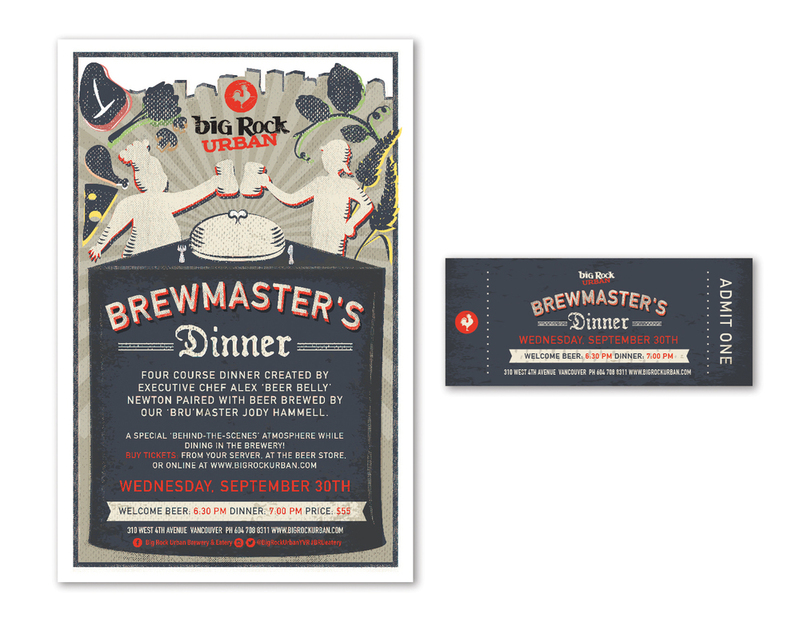 The meeting of the minds, chef and brewmaster was the theme for this special event, promotion included poster (shown), tickets (shown), website graphics, social graphics, table talkers and bill fold flyers. Every Monday night is 'Rorschcask' night at Big Rock Brewery (a neat way to get punters in on the slowest day of the week). These signs hang off the cask in view of brewery customers, and are also placed on the door each Monday. A play on words, all signs have Rorschach psychology test prints in the background, the casks are experimental, and the signs reflect! Can you hear the roaring 20's drums in the background? This event graphic captures the 1920's feel, and used poster, online and social graphics, tickets and table talkers to promote. This is an example of one of our event packages, see our packages page for more info.